Chris Crummery at the AIG Dublin GAA Jersey Launch. 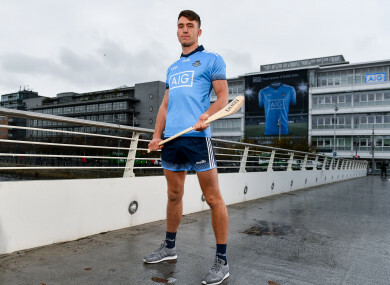 WHILE SHOCKED AT Pat Gilroy’s sudden departure, Dublin senior hurling captain Chris Crummey hopes that his successor can be appointed as soon as possible. “With the new structure you really want to be peaking for early May and that places greater emphasis on the work that you do in November and December,” he said today. Dublin are on the hunt for a new a new hurling boss following Gilroy’s sudden exit last month after just one season in charge. The 2011 All-Ireland football winning manager stepped down citing work commitments after a year which saw the Sky Blues come so close but yet so far in Leinster. After their Division 1B league run, they defeated Offaly in provincial championship action but suffered narrow defeats to Kilkenny, Wexford and Galway. And Crummey says that the players themselves didn’t envisage the unforeseen departure. “I suppose it came as a shock to us,” the Lucan Sarsfields defender continued at the AIG Dublin GAA jersey launch. “Obviously Pat probably knew about the situation for a long time but kept it to himself and only made the final call when he knew it was totally unfeasible to manage both his work and the managerial role that he had. He further explained: “We’re disappointed because we held Pat in such high regard as a manager. That’s what makes the appointment of Gilroy’s successor even more important, the 24-year-old All-Star nominee continues. Dublin aren’t far off. “I suppose every managerial appointment is a big appointment but this one in particular, we feel like it’s a managerial appointment where we need to build on the good work that went on last year and that’s very, very important for this group of players. “We know how close we are but at the same time, it’s up to us as players to drive it as well and make sure that we take those learnings and close those games out when we get that chance to next year. “The belief for us, as players last year was always there. It’s huge credit to Pat because he really instilled that belief in us as well. “We feel that there was huge progress made last year and if we can build on that progress, we’ll be a very hard team to beat. We’re just looking forward to getting going. Reflecting on 2018 as a whole, it’s a disappointment. Crummey and his side wanted to make the Leinster final and go further from there. People wrote them off, didn’t give them a chance, he adds. But that’s the challenge going forward, to overwrite those disappointments and prove the doubters wrong. On an individual level, he finished up with a 2018 PwC All-Star nominee, a reward for his outstanding efforts and glittering performances in the half-back line. A nice way to cap the year. “It’s a nice recognition for myself, my family and my club and all the club coaches and mentors I would have had growing up,” he smiled. Dublin stars Brian Fenton, Chris Crummey, Olwen Carey and Eve O’Brien were on hand today to help Dublin GAA and sponsors AIG Insurance to officially launch the new Dublin jersey at AIG’s head office. Email “'It was a shock and we were very disappointed, but we understand where Pat is coming from'”. Feedback on “'It was a shock and we were very disappointed, but we understand where Pat is coming from'”.